Its a Boy Baby Shower Theme, Diaper Cake & More! Get some creative inspiration with these Its a Boy Baby Shower ideas! 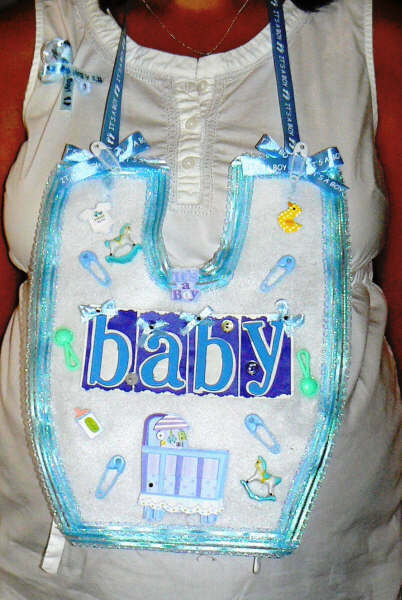 Everything from a boy diaper cake, to food, games, favors, decorations and keepsakes for the mommy-to-be. 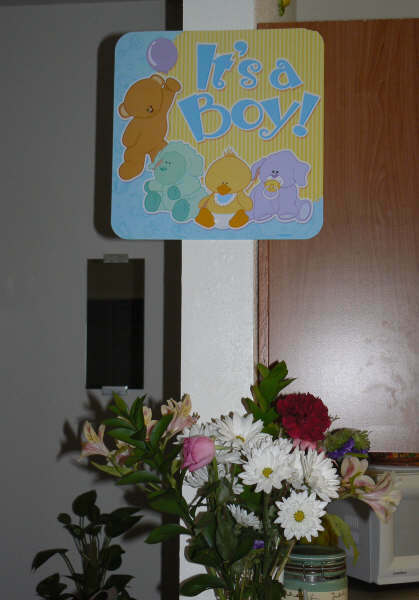 The adorable ideas, pictures and tips below are all submitted by Ligia, a caring, helpful reader who shared her ideas here to help give the rest of us some help with how to throw our own boy baby shower! 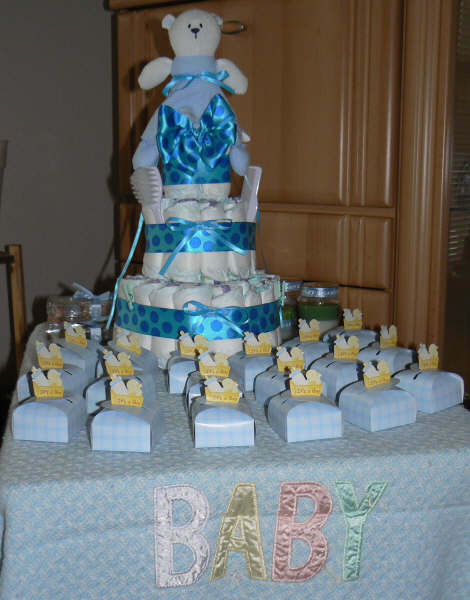 Because of readers like Ligia, we have the very best resource of baby shower ideas on the web! Thanks for sharing, Ligia! This was a surprise baby shower! I actually made the cake by getting ideas from your website. Mostly I used a nice polka dot ribbon and added little things to make it simple and pretty. I also had little boxes around it, for the guests to take home. It included chocolates, mint and little baby rattles, pins, and bottles. I used a nice baby blanket as the table cover. We also had 3 games. One was getting a couple of diapers and smudging chocolate bars inside, to make it look like a dirty diaper. For each diaper it had a different chocolate bar and the guest had to smell and guess what kind of chocolate it was. I numbered each diaper and wrote the answer for each, to know which diaper is which. I bought chocolate that was not known by many people that way it made it harder. For ex. Babe Ruth, Almond joy, 3 Musketeers, Milky Way, Butterfinger, etc. The other game was your old wise tales; everyone really enjoyed that one and learned something new. For the last game I made like a necklace with a baby rattle attached on it for each guest to wear and every time someone mentioned the word baby they would take their necklace. That was pretty funny too. We had lots of food, dessert, wine and margaritas. I recommend margaritas for a baby shower! I also got a little baby shower book were u can write down a message for the mom-to-be and the gift u got her. It was a really good idea, so she could know who got her each gift and keep it as a keepsake. Another thing a made was a baby bib for the mom to wear. I used blue ribbon and it's a boy ribbon for the sides, then I used 3D stickers with baby stuff and hot glued it all on the inside along with rattles, pins and little rocking horses. She really liked that and looked very nice on her. Overall the shower was great and she was very surprised! Thanks so much Ligia!! 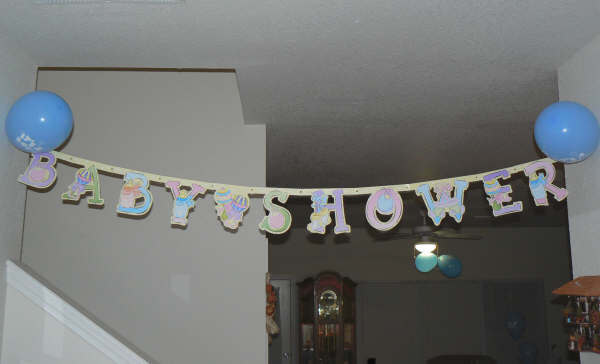 What an adorable Surprise Baby Shower!